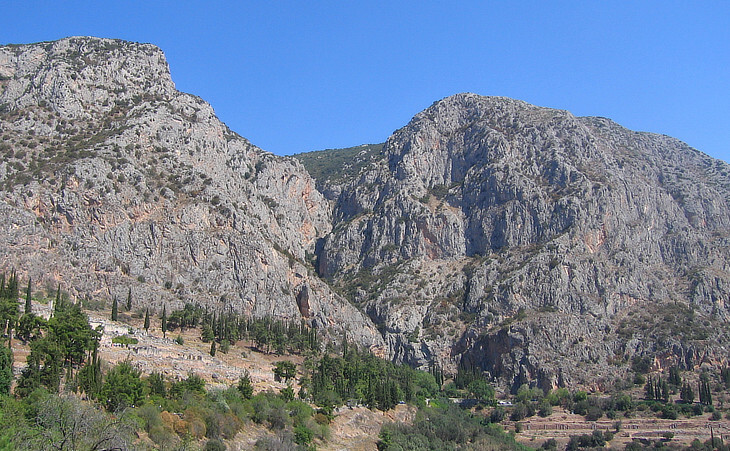 In the very distant past, before Greek civilization developed, shepherds noticed a crack in the rocks above the River Pleistos valley, which they crossed to bring their flocks to the summer pastures of Mount Parnassus; a spring (Castalia) came out of the crack; the shepherds felt the site was evocative of female fertility. One of their reasons for this view was the reddish colour of the rocks (Fedriades) on the sides of the fissure. 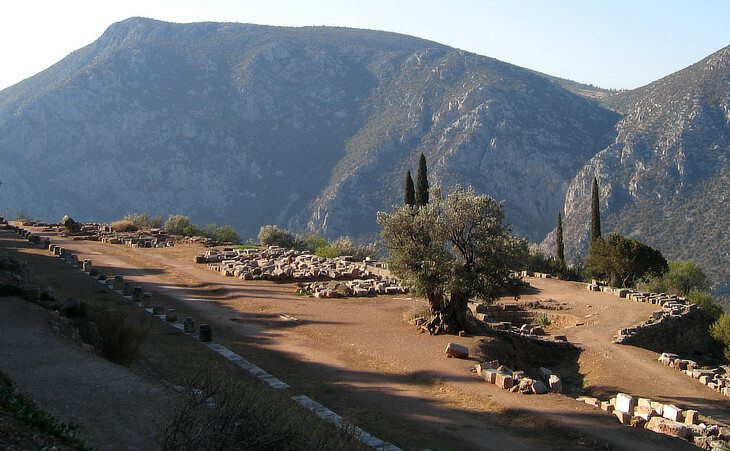 Delphi, at the beginning just a small terrace at the foot of Fedriades, most likely a resting point for the shepherds, became a site where Mother Earth (Gaia) was worshipped: perhaps the actual presence of snakes led to the belief that Python, a gigantic snake, protected the goddess. 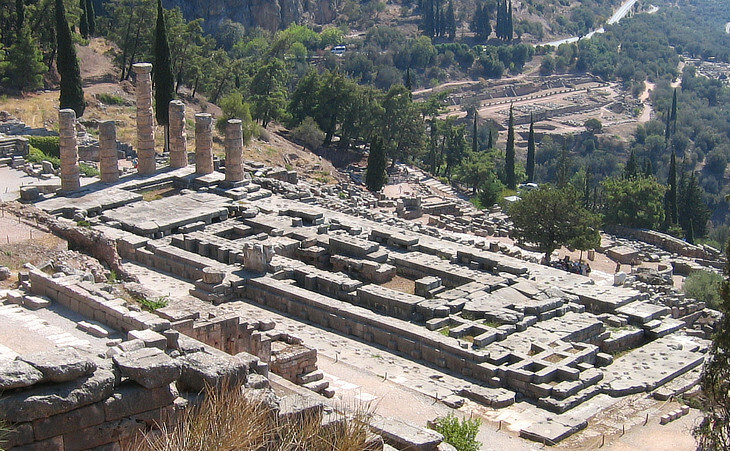 The religions of many past civilizations were mainly concerned with good and ill omens and prediction of the future, rather than moral behaviour and life after death, so the worship of Gaia was associated with an oracle; the number of very ancient artefacts found at Delphi show that it attracted many devotees. At that time the oracle was called Putho. The move from the worship of Gaia to that of Zeus and the other gods of Greek mythology is usually associated with the invasion of southern and central Greece by the Dorians; the myth explaining the change is regarded as a metaphor for how the newcomers imposed their rule. The Greek god Apollo had, among other names, that of Smintheus (Mouse) and he was associated with the spreading and curing of disease: mice and snakes being enemies it is no surprise that Apollo's first act was to kill Python and impose his own cult on Delphi and Mount Parnassus, which he made the residence of the Muses (Apollon Musagetes). The myth does not hint only at fighting and conquering; it also speaks about merging of cultures. Apollo changed the name of the site from Putho to Delphi (a reference to the dolphin which carried him there), but the tradition of the oracle continued and Apollo spoke through the words of a woman who retained the old name: Pythia or Pythoness; in addition he had many peaceful attributes: he was the god of music and poetry and presided (through his son Asclepius) over medicine: in this last aspect the snake acquired again a positive role (it is now a symbol for physicians across the globe). Every four years music and poetry competitions were held to celebrate Apollo: later on their scope was expanded to include athletic games and chariot races. 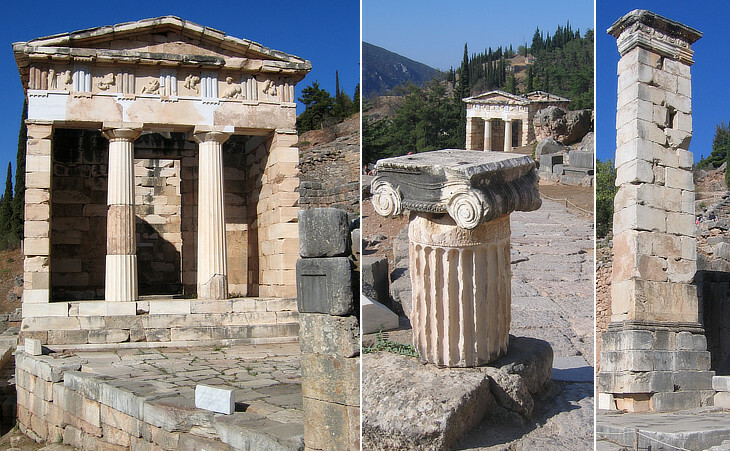 As a consequence of the change in worship, the shrine of Delphi was relocated on the left Fedriade, and the old one became the starting point for the processions going to the new site: today it is called Marmaria (marbles) and there are ruins of two temples dedicated to Athena: between them archaeologists have identified a circular temple which is assumed to have been dedicated to Gaia. The processions of worshippers going to the new shrine went through a gymnasium where the athletes and more in general the youth of Delphi exercised; it was built on two long and narrow terraces on the flank of the mountain: in the upper terrace a xystos (covered portico) allowed training during winter or in rainy weather; the lower terrace had a palaestra (wrestling school) and a small circular pool. 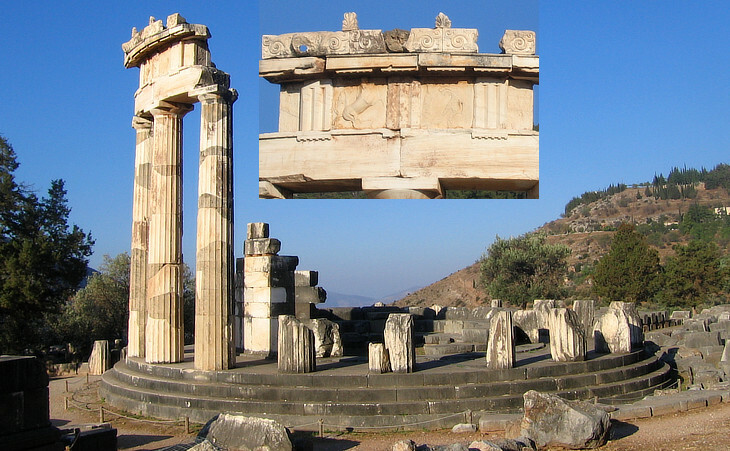 The Oracle was closed by Emperor Theodosius: Delphi was deprived of its main attraction and rapidly lost importance and inhabitants, so evidence of the Christian town is limited to some Byzantine plutei (parapets) which decorated a church inside a large Roman portico. The history of ancient Delphi spans more than a thousand years and the archaeological site retains many interesting inscriptions: (1) is a very old inscription celebrating the kings of Argo: it shows an example of "bustrophedic" writing (one line is left to right and the next right to left); (2) a long inscription characterized by a very small print lists more than 800 cases of manumissions (releases from slavery): similar inscriptions have been found in other archaeological sites, such as Butrint; (3) is an inscription celebrating Emperor Trajan: the Oracle was asked for predictions by several Roman Emperors (among them Nero who misinterpreted the utterance of the Delphic Oracle "Beware the age of seventy-three": he thought it meant he would live until that age, actually it was the age of Galba, one of his generals); (4) is a rare inscription in Latin: the full text is M(arcum) Minucium Q(uinti) f(ilium) imperatorem Galleis Scordistei et Besseis and it does not mean that Marcus Minucius was an emperor because during the Roman Republic imperator was a title roughly equivalent to commander. Seventeen Greek towns built treasuries to thank the Oracle for its good advice and to commemorate their victories or other achievements; they were sort of small temples having more or less the same structure and size; the Treasury of Athens was the only one built using Pentelic marble, so archaeologists have been able to reconstruct it. Also the monarchs of the countries next to the Greek world sent statues and other works of art to Delphi. The Oracle was located inside the Temple of Apollo: the ruins belong to a temple built in the IVth century: the columns were made of tufa and then covered with plaster: its length is slightly shorter than the Parthenon of Athens while its width is much narrower: this very long shape is due to a crypt behind the cell of the god: it was an adyton, an area to which access was not allowed and the site where Pythia prophesied. The underground chamber where she stood was small and filled with smoke: she chewed leaves of laurel, the aromatic shrub sacred to Apollo. A description by Heraclitus of a Sybil's prophecy is most likely applicable to Pythia too: The Sibyl, with frenzied mouth uttering things not to be laughed at, unadorned and unperfumed, yet reaches to a thousand years with her voice by aid of the god. The words of Pythia (or rather the sounds she made) were interpreted by priests who only could hear them: the outcome of this process was often a carefully worded sentence having different meanings; Croesus, king of Sardis decided to wage war on the Persian Empire on the assumption that the Oracle was advising him to do so: he lost his own kingdom; in hindsight the sentence could also be interpreted as a warning not to wage war. Alexander the Great was so dissatisfied with a vague statement about the campaign he was about to start, that in a fit of temper he entered the adyton and dragged Pythia by the hair out of her sanctuary until he obtained the favourable advice he wanted. The contests of music and poetry took place in a theatre above the Temple of Apollo: from the highest seats the audience enjoyed a striking view on the whole town and on the valley beyond it. The orchestra was reshaped by the Romans. Athletic games took place on the plain near Kira, the harbour of Delfi: this until the IIIrd century BC when a stadium was built on an artificial terrace well above the theatre. 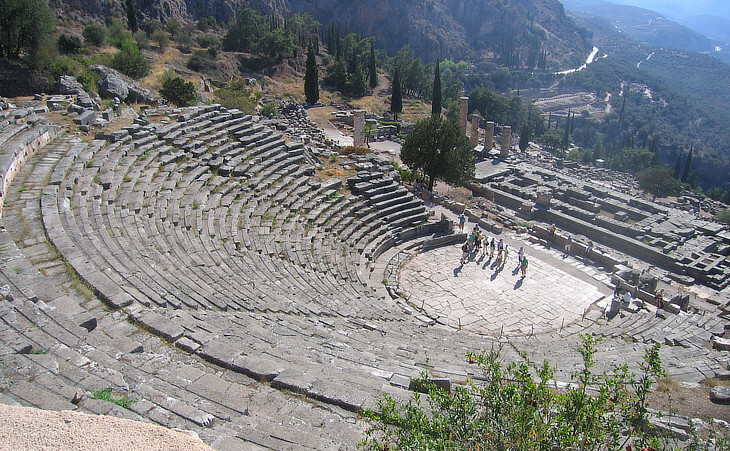 The audience sat on the sloping ground at the sides of the track: in the IInd century AD Herodes Atticus funded a major upgrading of the stadium. 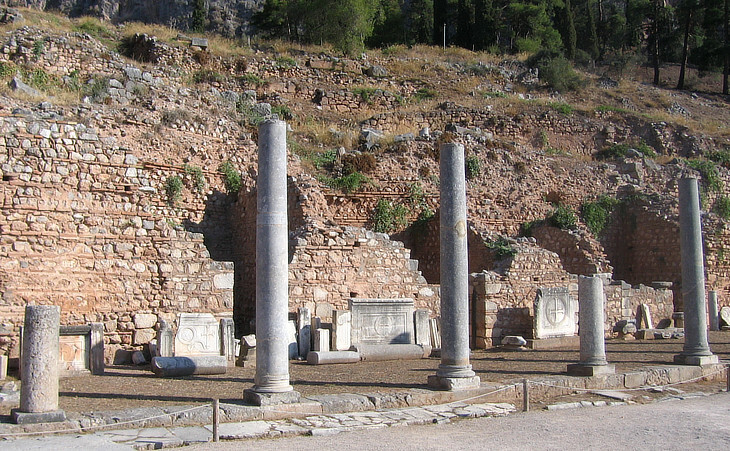 Move to page two to see the works of art found at Delphi.